Safely Remove Hardware and Eject Media icon missing? How to safely remove hardware or USB flash drive in Windows 10? USB drive not responding? Safely remove hardware and eject media icon missing? This page will show you how to safely remove USB device in Windows 10. Everything about the safely remove hardware and eject media feature in Windows 10 should be the same as that of Windows 7, 8 and 8.1. The only difference is that the icon in Windows 10 might look a little bit different from that of its predecessors. So, you have plugged a USB flash drive into your PC and wonder where the safely remove hardware icon you usually click onto has gone? Well, in Windows 10, the Safely remove hardware and eject media icon looks slightly different than that in Windows 7 or 8. It looks like the icon shown in the screenshot below. It should appear whenever you plug a USB media device, particularly storage devices (excluding keyboard, mouse or speaker), into your computer. To safely remove your USB drive from your PC, look for the safely remove hardware icon in the Show hidden icons area. Left click on it, and then click eject for whichever media you wish to remove. What if the safely remove hardware icon has gone completely missing from your Windows 10 PC? Well, it depends if you can access to your USB storage device or not. If you can’t even see your USB drive on This PC window, it most likely indicates that your USB flash drive has failed and need a repair or replacement. If your USB drive is working perfectly that you are sure it’s not its problem, the most possible cause would be the icon being hidden by the taskbar setting. 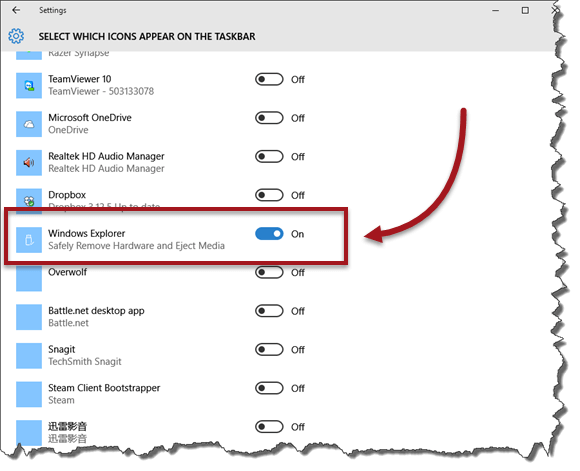 You will have to simply re-enable or unhide the safely remove hardware and eject media icon from the Windows 10 taskbar notification setting. Right click anywhere in your taskbar, select Properties. 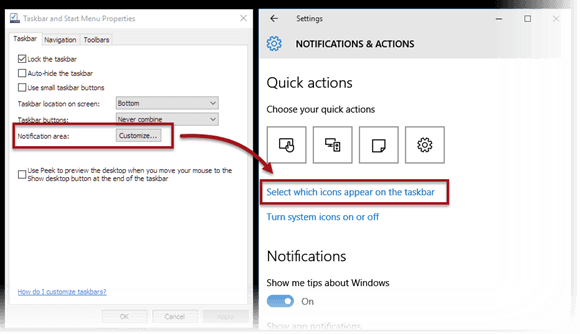 Under the Taskbar tab beside the Notification area field, click on the Customize button. In the newly opened window, click on the Select which icons appear on the taskbar link. Turn on the option for Windows Explorer, Safely Remove Hardware and Eject Media as shown in the screenshot below. Now, the safely remove hardware icon should show in your taskbar beside networking and volume icon. Click on it to eject any USB media you have connected. Sometimes when a file transfer got stuck or an error occurred during the process, the safely remove hardware icon will freeze and won’t be responding even if you click on it. If this is the case, try to terminate whatever file transfer it was running and eject the device again. If even the transfer process is hanged or frozen, you have no choice but to force unplug your USB flash drive. It will also force terminate whatever transfer that was running. You can also try to force restart your PC which will return the same result. By right, it shouldn’t do any harm to your physical USB flash drive. It will only cause a crash to or possibly destroy the files being transferred or even the files previously written in the flash drive. A simple reformat of the drive will usually solve the problem, but whatever data and files in the flash drive will be removed in the process. Retrieve as many files as possible before you format your drive if your USB flash drive is failing. If you have a specific problem regarding safely remove hardware feature, ask in the comment section below. We will try to sort it out and possibly come up with a solution that can help you and the community.